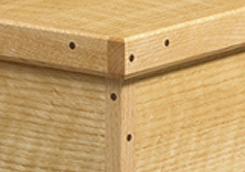 It's easy to use the stepped bit and stepped dowels you'll find with Miller Dowel Company. Based in Chicago, Illinois, we've made it easier to join wood and create beautiful, functional, and lasting wooden works of art. Here's how you can use our parts. Using the Miller stepped bit, a pilot hole is drilled through the top piece and into the substrate. 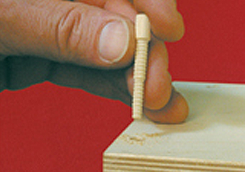 Apply glue to the rib section, and insert the dowel, tapping until it is flush or fully seated in the hole. The remaining portion can trimmed off or sanded until smooth. 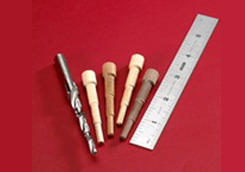 Begin by selecting the best-sized Miller Dowel and corresponding Miller Dowel Drill Bit for your application. Align and secure the wood pieces to be joined. You may even choose to glue and set all components in place. Drill the stepped pilot hole for the dowel. Next, spread a small amount of glue on the ribbed sections of the dowel and insert it, so that it drops approximately two-thirds its length. The dowel will self-center and align with the second board even if you have not pre-glued or clamped the components. Tap in the dowel until it's fully inserted and trim or sand any raised portions. The depth drilled determines the depth of insertion. This not only allows users to countersink, tap flush, or leave raised, but also gives woodworkers the option to only use a portion of the dowel. If only two sections of the drill bit are used, then only two sections of the dowel will be inserted. 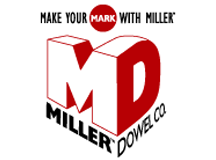 This technique doubles the versatility of the product because it means that each size Miller Dowel is two sizes in one. It is an ideal feature when depth or thickness is restrictive, or for achieving a decorative effect.